GUANGZHOU - Fu Minghui has found a new way of looking at things. The professor of applied mechanics and engineering at Sun Yat-sen University in Guangzhou, capital of Guangdong province, is relieved he persisted in his teaching after he lost his eyesight in 2001. "I was in pain, in despair, heart-broken and close to tears," Fu said, recalling the days when his vision gradually disappeared because of an inherited eye illness. Fu, a native of Heilongjiang province, received his PhD at a university in Moscow in 1995, finished his post-doctoral research at Tsinghua University in Beijing in 1997 and started to work at Sun Yat-sen University after that. His vision was reduced to the size of a coin after his eye illness started to worsen in 1997. "I couldn't finish a page when I prepared for my class. I couldn't even find the page number," he said. "At one point, I felt I couldn't go on anymore." However, it was hard to give up his love for the subject he had held since childhood, or let go of the chance to teach and do research at the university. Fu resorted to listening to his wife and students reading lecture notes and scientific literature when he prepared for classes - readings that were especially difficult and involved many formulas. "My wife hadn't had any math education beyond high school but she was eventually able to make the formulas clear to me." 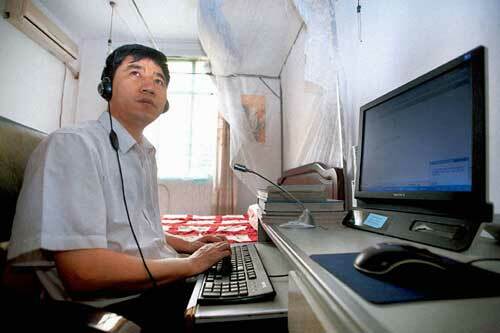 Fu had his confidence boosted when he obtained computer software that turned words into sound. "Then I could bother other people less," he said. Fu stopped teaching for the first semester in 2002 because he could not write on the board in class. One of his students helped him by inventing - and carrying for him - three big magnetic rulers so he could position himself at the board. Students clean the board and draw the complicated multimedia slides, with Fu drawing simple ones. Fu taught five undergraduate courses after he lost his sight but had to reduce the teaching time because undergraduate students were relocated to faraway Guangzhou Higher Education Mega Center. He is now teaching one undergraduate course and two postgraduate courses. "The more skilled I became, the less pressure I felt," Fu said. "It became not as difficult as when I started." What is more, Fu feels his classes are more interesting without the confinement of the lecture notes. "The subject can be very boring but I always think of some real-life examples and comparisons with interesting knowledge and jokes when I prepare for the class," the professor said. "In a sense, it is good not being able to see." Fu gathers his confidence from the acclaim and the in-class interaction from his students who take their studies seriously. Fu has hosted a number of State-and-provincial-level research projects, although he admitted the quantity and quality of his research falls short of that from his counterparts who can see. Fu's situation has pushed him to achieve in areas beyond his specialty: He created a patented method of computer input for the visually impaired, inspired by the similarity between Braille and the eight trigrams used in Chinese culture to represent the forces of yin and yang. His method, which enables the input of a Chinese character with two to four strokes, can be downloaded for free and is now used by many people. He offered a plan for mobile phone text input for the visually impaired to a developer and intends to apply for a project to promote its use. As chairman of the provincial association of the visually impaired and member of the provincial committee of the Chinese People's Political Consultative Conference, Fu proposed to the authorities in 2009 that digital barriers be removed for the visually impaired. Looking back at the past decade, Fu said one feels the most difficulty when closest to the goal. His biggest wish is to do better and better in teaching and research.